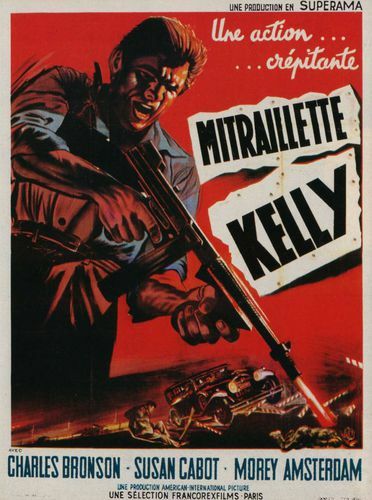 Roger CormanSpecialist of the fast movie with low budgets Often telling exotic stories(trouble) as this " Attack of the huge crabs " Dashes, with Machine-gun Kelly, into the macabre film. Inspired by the life of George KellyGangster raging during the big depression Corman stages a villainous couple, well before Bonnie and Clyde ofArthur Penn Charles BronsonIn the role of Machine Gun Kelly and Susan CabotThe vamp of service, the regular customer of the productions Corman. A psychopathic manager who loves the pumas! The band(strip) of loufiats imagines an attack of armored van, but at the last moment, Bronson Made overturn(collapse) the affair(business), because of a hearse and of a coffin who frightened him(her,it)! Because in this poisonous couple, appearances are misleading, and the virile GeorgeWho is afraid of deaths, is under the cup(cutting) of Susan CabotReal leader of the group. And by the visible kindness of George. The kidnapping was made a success, the history(story) is transformed into closed door, real Calvary for BronsonWhich(Who) is humbled by one Susan Castrating and his(her) hired man! The poor man George Will have only its phallus of steel, its machine-gun, to be respected! George "Machine Gun" Kelly Seems naked, without his(her,its) tool of preference, aboulique and totally enslaved(overcome) in the will of his wife! And laying down arms without fighting(disputing)! Preferring, ultimately the justice of the men(people) in that of his wife! He, who will collect afterward, the roles of "badass" and upholder of the law! It is surprising on the other hand that Susan CabotHaughtiness in " not tamed shrew ", had no career(quarry) in the measure of its talent. Because more than BronsonIt is her(it) who(which) bursts the screen and who(which) gives to this cormanien opus it " I do not know what " of devilish and it " almost nothing " of eroticism on the jazzy music of Gerald Fried. But the young actress, will abandon(give up) the cinema next year and will die tragically, murdered, in 1986. This movie will throw(launch) its career(quarry), and it will move on, the same year, with 7 Mercenaries of certain John Sturges !